It has arrived! 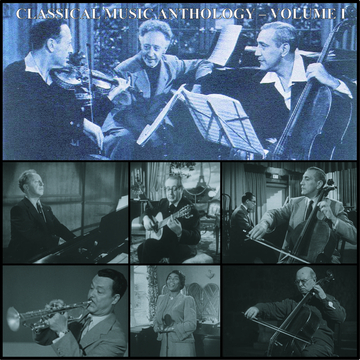 This treasure-trove of the best classical artists of the Twentieth Century featuring the forgotten performances by Jascha Heifetz, Artur Rubinstein, Gregor Piatigorsky, Andres Segovia, Marian Anderson, Pablo Casals, Rafael Mendez and more is a real gem! All recordings have been re-mastered and boast intimate performances captured on film. Classical Music Anthology is a collection of classical music performances by some of the world’s greatest classical artist of the Twentieth Century. Included in the collection are performance by Jascha Heifetz, Artur Rubinstein, Gregor Piatigorsky, Andres Segovia, Vronsky & Babin, Rafael Mendez, Marian Anderson & Pablo Casals. These eclectic recordings represent a treasure-trove of musical greatness. Each recording has been audibly enhanced for the digital age, so they will not be forgotten and will be continually enjoyed by future generations of classical music lovers. The performances which have been captured on film have been preserved by the producers for the production of a documentary. The documentary series will not only be a masterpiece of rarely seen film footage, but it will be an educational, inspirational and intimate look at what goes into making an Olympian in the world of Classical music. Click here to visit the Classical Music Anthology Electronic Press Kit.